Spend Matters has released its Q1 2019 SolutionMap, ranking 58 procurement software companies across 12 solution categories. Procure-to-Pay (P2P), which maps e-procurement, e-invoicing and payments (invoice-to-pay), and P2P suite solutions. Strategic Procurement Technologies, which maps sourcing (e-sourcing), spend analysis, supplier management and contract lifecycle management (CLM) solutions. Source-to-Pay (S2P), which maps end-to-end suite solutions that offer P2P and SPT capabilities. Contingent Workforce & Services Enterprise Technology, which maps Contract Services/Statement of Work (SOW), Independent Contract Workers (ICW) and Temp Staffing solutions. 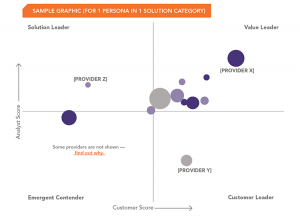 Begin exploring procurement software vendor rankings now, in the quadrant-graphic format below, for free: Visit the SolutionMap homepage. Although no new providers were added in Q1, there were two newsworthy developments involving participating solution providers. Corcentric, a provider focused at the intersection of accounts payable automation, order-to-cash, trade financing, procurement consulting and group purchasing organization (GPO) software and services, announced its acquisition of Determine in February 2019. Secondly, Jaggaer announced the release of Jaggaer ONE, also in February 2019, which unifies three of its product lines — Jaggaer Indirect, Jaggaer Direct and Jaggaer Advantage — without moving them onto a single code base, allowing customers and prospects to select the best modules from each offering to fit an organization’s unique needs. 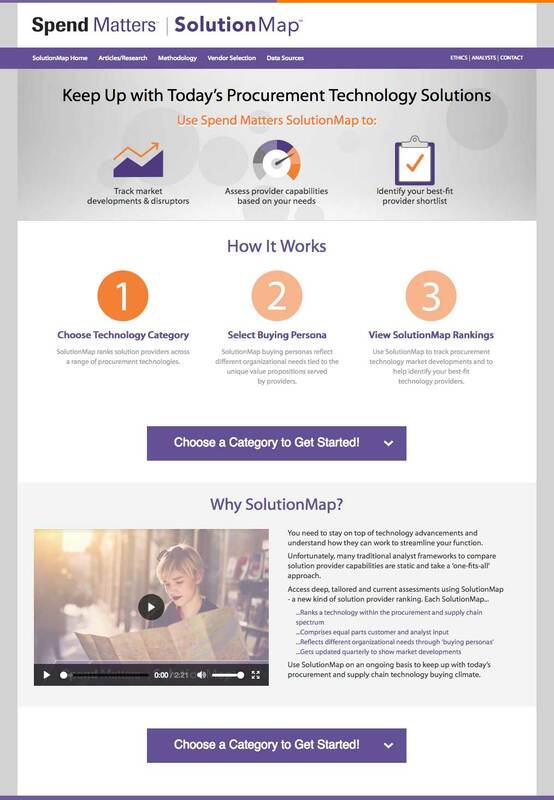 Browse all available SolutionMap content and articles here. 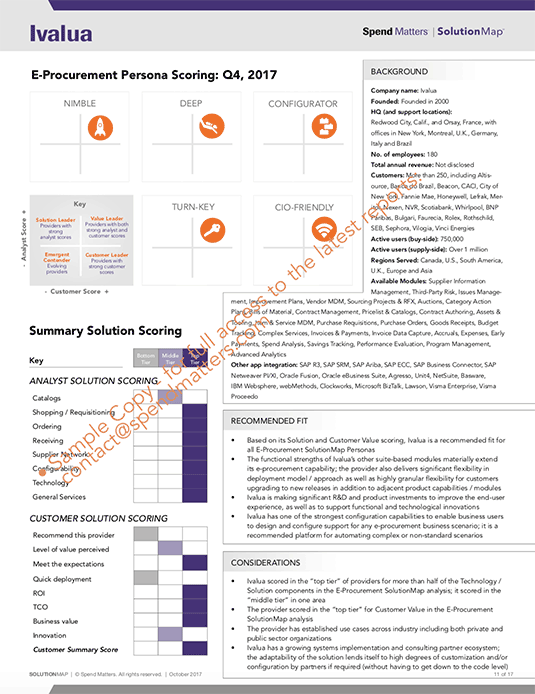 And for full access to the list of all participating procurement software companies, their complete detailed scoring summaries and all deep-dive content at the link above, learn how to become a SolutionMap Insider. What Is Spend Matters SolutionMap, and How Do I Use It? 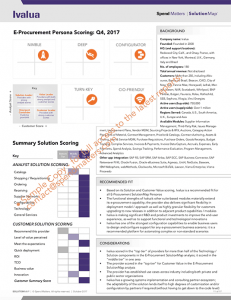 SolutionMap provides procurement and supply chain organizations with a comprehensive means to compare software companies across categories, assess vendor capabilities based on organizational needs and identify best-fit shortlists for solution selection. You’ll also be able to learn about each procurement software category and persona definition in detail, as well as read up on the Spend Matters analyst team’s methodology, before seeing how this quarter’s participating vendors performed. Want to Get the Most Mileage Out of SolutionMap? We’re no strangers to automotive metaphors here — indeed, the founder of Spend Matters has a penchant for cars, and we’ve found that nearly all things in the procurement software market can be expertly painted with the brushstroke of a car metaphor. You chuckle, but boy are they applicable. As our colleague Sam Rea has noted, “For practitioners making a tech selection, or those simply looking to understand the market, the long list of providers can seem daunting and complex. For both sides to achieve the deepest understanding of these technology markets, we have to get under the hood (see?) with SolutionMap Insider. On a self-service basis, anyone can sign up for our new SolutionMap Insider subscription. This includes members-only access to Provider Scoring Summary reports and to ratings of all participating procurement software companies.